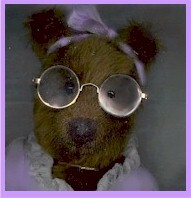 Abigail Freeman is a lovely bear of indeterminate age. 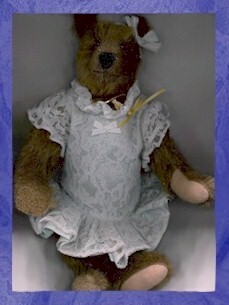 She came to live with me after I discovered her in The Doll Shop in Overland Park, Kansas. You could say that her 'beauty' is more of the "inner" kind. But she caught my eye because of a proud, regal bearing and wonderful taste in her clothing and jewelry. Even though she works as the town librarian, it is more to keep busy and to serve her community than because of a need for an income. She comes from a fine, old-line family and, it is rumored, she inherited a comfortable fortune from her Grandmama Freeman. She has no near relatives surviving, having been orphaned at an early age, when her 'Mamma' and 'PaPa' died in an unfortunate hunting accident. She always has been quite nearsighted and Grandmama Freeman had, when Abigail was a youngster, insisted that glasses work best when they are chosen for size and not for vanity, so Abby suffered the teasing of her peers at grammar school and developed an impenetrable reserve which carried her into adulthood with a practical nature. So for several years Abigail lived in my Hug, enjoying her life and becoming a reliable and productive member of the community. She formed a close friendship with Miss Trudy, (also a spinster) and they, between them, were instrumental in instigating many of the most successful social events, including Teddy Bear Teas for the Ladies of the Hug and an occasional picnic in the woods for the younger cubs. Receiving a coveted invitation to one of the Teas was a social coup for the ladies, as it gave them the chance to show off their bear finery, especially their beautiful dress up hats, and to catch up on the gossip in the ever expanding Hug population. One fine Spring day, Abby and Miss Trudy were picking violets at the edge of the woods and planning the first picnic of the season, when they heard a crashing and thrashing about in the underbrush near where they were. They whirled around just in time to spy a very tall, rather imposing and most flustered fellow, pushing aside the tangle of bushes to step into the meadow about fifteen yards from where they were standing. He caught sight of the two of them and bounded forward, with a wide, and Abby thought, somewhat foolish grin on his face. "Well, I'm sure glad to see a friendly face" he blurted. "I've been on a ramble and I'm afraid I just got fearfully turned about and had absolutely no idea where I was getting to....where I had been....or how I was ever going to find my way back to my friend's house. Boy, it is good to see another face and I'm sure you can give me a clue as to how to....er, find my way back....". The big fellow's words seemed to finally run out and he just stood before them, somewhat sheepishly, and kept grinning. The imposing bruin towered before the two ladies, who certainly felt very petite and feminine in his presence. Miss Trudy suddenly trilled a little giggle. "Joe, I hardly recognized you. You have really grown and gotten....older....well, I guess we....all have. Er, what in the world are you doing back here in this neck of the woods?" "Trud? My gosh, is it....wow, it is you! Well, this IS great! Yeah, I've kind of gotten over my wanderlust and, well... now that Mom's gettin' older.... 'n' all...well, I just decided to come home. I moved back a couple of days ago....been staying at Ted's until I can get a place. Mom's talkin' about leaving the retirement home and us getting a little place together. I....". As before, Joseph just seemed to run out of words and the big smile shown out again. Introductions were completed and Abigail found her sizable bear paw swallowed up in an even larger paw and pumped enthusiastically up and down, rather like a pump handle (She thought later, whenever she recalled that first meeting). Over the course of that Spring and Summer, Abigail and Joseph ran into each other frequently. They had many friends in common and, the warm weather social scene being so full, they saw each other a great deal. For being such a voluble fellow, Joseph---'one on one'---did seem rather shy and so their acquaintance blossomed slowly. Joseph's Mother, having followed through on her plan to get a little house for herself and her "Joey", didn't encourage him into actually dating anyone and Joseph's respect for his Mom, kept him from considering anything like a dating relationship. Instead, as one of the 'younger' generation, there was a great social circle of friends who spent a large amount of time just having fun and divertissement together. However, Abigail felt the tiniest flutter in her chest whenever Joseph came through the door and, as for Joseph....well, he found himself just a little tongue tied when trying to make small talk with the quietly graceful Miss Abby. Abigail, feeling that Joseph was, without a doubt, never going to be interested in a plain girl like her, made a conscious effort to form a true friendship with this big, kindly fellow by drawing him out on any number of subjects from politics to philosophy of life, since by doing so, she felt that she could have something satisfying with Joseph as her True Friend. Their circle of friends, teased them into joining in the general fun, when ever they felt that Joe and Abby had been sitting, quietly talking for too long. And so the Summer passed and also the Fall. 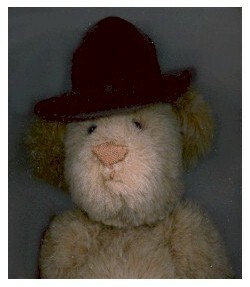 News began to reach the Hug about conflict in the Middle East and when it became apparent that we would be drawn into war and that many soldiers would be needing Teddy Bears to keep them company during this action (being referred to as Desert Storm), some of the bravest among the hug volunteered to go. Abigail knew that Joseph's moral code and sense of duty would impel him to go also and it broke her heart, at the same time as it caused her to feel pride in the fact that he would put his own life on hold for this cause. Abby heard from Trudy that Joseph would be leaving with the others in only a few days. She wanted Him to know of her concern and also ask his advice on a pen pal program that she was thinking of running so that the soldiers would get mail from home. She hoped to see him at a going away party that was being planned for the brave bears' last evening in town. However, the night before the party, there was a knock on the door, shortly after she had finished doing her supper dishes. Joseph was standing there with a distressed look on his handsome face and he stammered a rather disjointed explanation for showing up unannounced. "Joseph, you must be freezing." Abigail exclaimed. "Come in, please. Have you eaten? Well, at least have some hot honey tea and some of this honey cake that I just baked." They sat down before the warming fire which she had a habit of laying on these cold winter nights and munched contentedly on the honey cake while they discussed the pen pal idea. They also spoke of many other things, as though sensing that it could be many long months before they would be able to share their thoughts again in person. Joseph seemed to have something more to say, but Abby couldn't find a way to draw him out. Finally, the conversation died as they stared into the fire. Then Joseph reached over and took her paw gently between both of his and began to explain why he had really come to see her. They sat very late in the front parlor, with Abby's head resting against Joseph's strong, broad shoulder and spoke in quite tones of all their feelings and concerns for one another. Their friendship had flamed into a deep and abiding love. They discussed Joseph's mother and decided that a very long engagement was best for them. It didn't matter. They were meant to be together and their love would only grow and mature as the time passed. Abigail went to her sewing box, just before Joseph kissed her goodnight and pulled out a little length of yellow ribbon. Tying it into a bow, she pinned it to her dress and promised to wear it at all times until her Joseph was safely home again. And She Did. Joseph's love for Abigail has brought her a new confidence in herself. She now wears contact lens which she got while Joseph was away. Joseph tells her often, how beautiful she is and it still gives her a thrill every time he says it. Theirs is a True Love Story. We should all be very happy for them.